Follows the brilliant, wild, and extravagant Kristina of Sweden (Malin Buska). Crowned queen at the age of six, Kristina was thrust into the confines of power and tradition well before any monarch should. 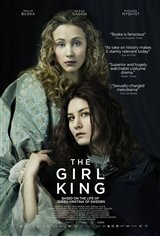 Constantly under pressure to marry and produce a male heir, Kristina's only source of peace and love is in her lady-in-waiting, the beautiful and elegant countess Ebba Sparre (Sarah Gadon). However, soon even her pure relationship with Ebba is used to manipulate her, forcing her to fight against the conservative forces surrounding her.